While it is possible to carry out some basic repairs to older window yourself, it may be more cost effective to have the work done by a professional. Simple things like changing a handle can become very expensive if the screws used are too long and they break the glass. On older timber casement windows the glass is held in place with putty. This needs to be chopped out using a hammer and chisel. If you are attempting this it is important to wear goggles, as the putty can be very hard and can break off in sharp chunks that can easily damage an eye. Another danger is that of the glass itself. Because the removal of the putty requires vigorous work it is not uncommon for a tired hand to accidentally make contact with the broken pane of glass. Gloves will offer some protection but a pointed piece of glass will easily pierce through most gloves and can cause considerable injury. Replacement glass needs to be measured very accurately. Obviously glass that is too small is will be of no use, but likewise, glass that is only a little too large is similarly useless as it is not possible to cut very small amounts off of a piece of glass. For this reason it is important to follow the old adage of measuring twice, and cutting once. Allow some space for the glass and consider waiting until the old glass is removed before attempting to measure for the new pane. When you decide to repair your home windows, firstly you have to determine the kind of window repairs that you want. Basically, repairing is the work of salvaging something rather than replacing it completely. Although there are many kinds of window sizes, styles and shapes available, all of these can be repaired. However, modern windows are complex and can be challenging to repair, for this reason you should always use a professional repair service or qualified person for window repairs. 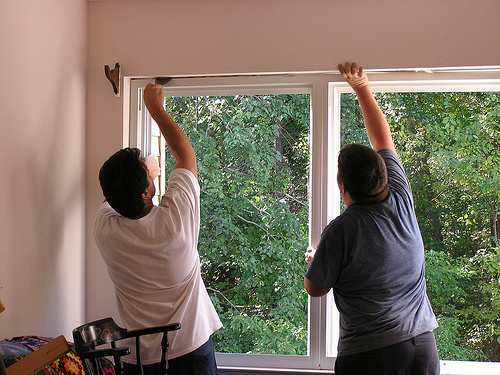 Window repair services include replacing window glass, replacing handles, locks and hinges.